No matter what stage of life you are in, good oral health provides great benefits for your overall health and wellness. Dr. Marracino's family and cosmetic dentistry practice welcomes patients of all ages for comprehensive dental care. 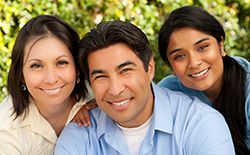 Both children and adults need education, training, and guidance to establish a home and professional dental care routine. Great dental visits as a child can inspire dedication to oral health throughout life. Dr. Marracino also offers preventive sealants and fluoride to protect young teeth while they develop. In addition to children’s dentistry, we offer preventive adult dental care with checkups and cleanings. At a checkup, we look for tooth decay or damage, gum disease, signs of oral cancer, TMJ dysfunction, and other potential or existing oral health problems. Digital X-rays and intraoral photos help the dentists make accurate diagnoses and plan effective treatment. Treating gum disease, addressing decay and tooth breakage, and replacing missing teeth will boost your oral health, overall health, and quality of life. Many people aren’t aware that the dentist can address problems like chronic headaches and neck pain. Disharmony in your smile's bite and your jaw muscles can cause functional problems and discomfort such as migraines, teeth grinding, and tooth breakage. At your consultation, Dr. Marracino will screen for Temporomandibular Disorder (TMD). Be sure to share any medical concerns you might have and feel free to ask questions about TMD symptoms and treatment.